Choose to eat real food that keeps you full and focused. 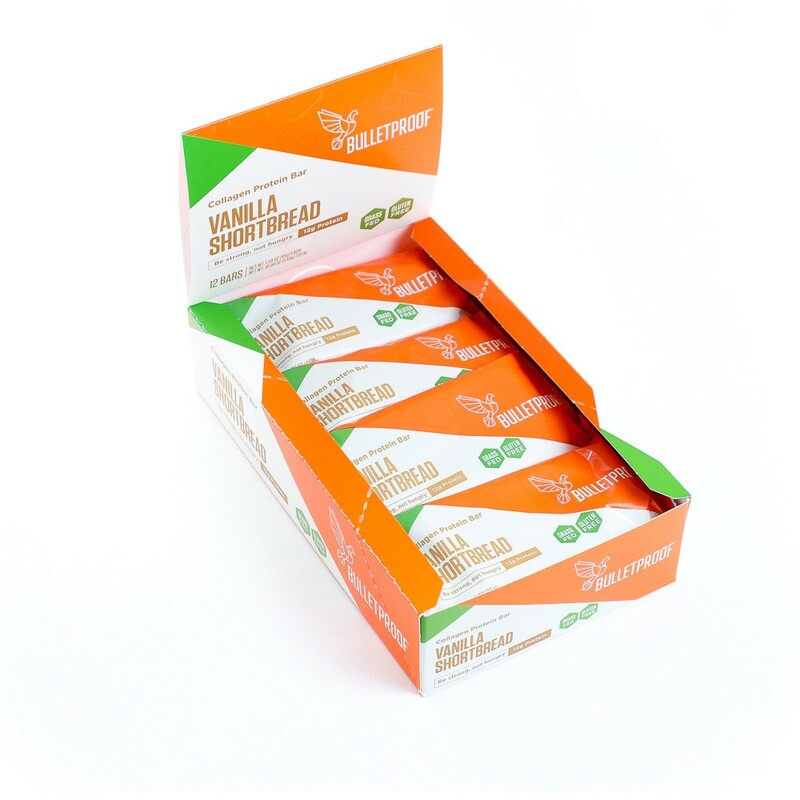 We have evolved our previous VanillaMax bars to have an amazing shortbread-like texture for maximum fuel on-the-go. You might even be able to eat them without a napkin or while riding your bike. The possibilities, like you, are unlimited. 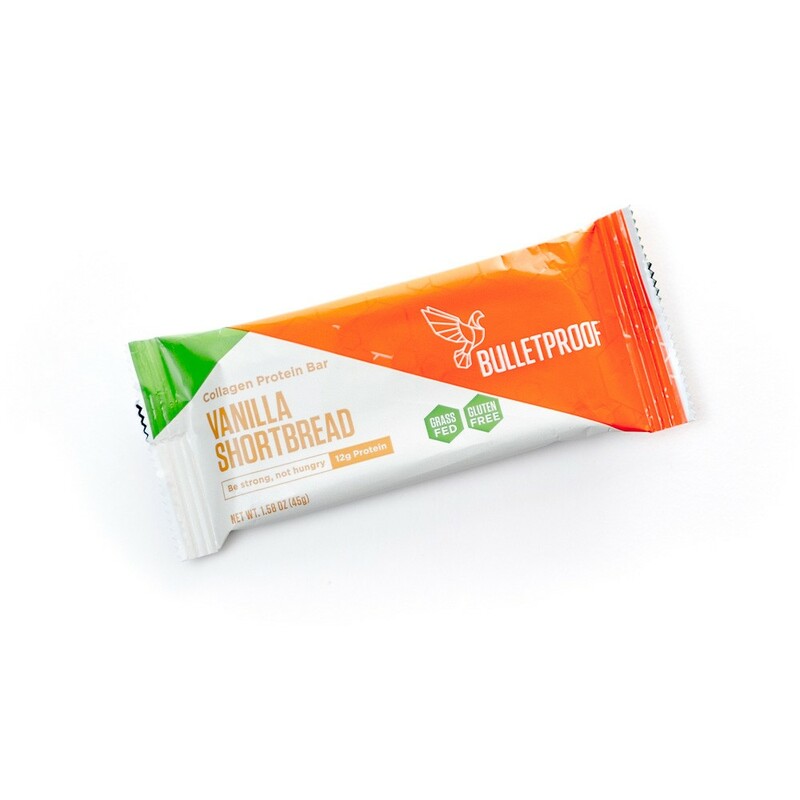 Made with Bulletproof™ Collagen protein from grass-fed cows. These bars have the same amino acids found in bone broth which are the building blocks of bone, joints, and skin. Plus, added Bulletproof Brain Octane® oil and XCT® oil to keep you performing with steady energy. The ingredients are delicately processed at low temperature to preserve their natural flavors and to make sure you’re getting the maximum nutrients in every bite. Organic cashew butter, grass-fed collagen protein, chicory root fiber, Bulletproof XCT® oil powder (caprylic and capric acid triglycerides from highly refined coconut and/or palm kernel oil, tapioca dextrin, tapioca), organic cashews, Bulletproof Brain Octane® oil (caprylic acid triglycerides from highly refined coconut oil), organic coconut oil, lab-tested vanilla beans, sea salt, stevia. How are these different from the previous VanillaMax Collagen Bars? The ingredients are exactly the same. We optimized the bars to be less oily without compromising fat or protein levels. No. Store your bites at ambient or room temperature, and we advise you to keep them out of direct sunlight. How do these compare with other protein bars on the market? These bars provide protein from only collagen and nuts. No dairy, no grain, non-GMO. These bars provide quality fats that are supportive for a ketogenic dietary lifestyle. Can I get a box of mixed flavors? What is chicory root fiber and why is it in your product? Chicory root (also known as inulin) is fiber. It contributes to your daily intake of fiber to support smooth digestion. Inulin is a prebiotic – an ingestible long-chain soluble fiber that your gut flora (the good bacteria you already have in your gut) can consume and ferment. You can think of prebiotic foods as high quality fuel for your gut bacteria. What I am experiencing slight indigestion when I eat the bar? This may be caused from the prebiotic inulin. If prebiotics are not a part of your regular diet, you may experience some indigestion when first consuming Collagen Bars and Bites. 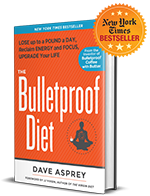 This is a temporary side effect from feeding your gut flora and should lessen as your body adjusts. What is the source of cashew butter? The cashew butter is organic. Should I not take this if I’m allergic to nuts? Do not consume if you are allergic to nuts or coconut. Are the cashews tested for mold? Yes, we only source our organic cashews from specific suppliers that care about quality and we test all of our products including our bars to meet stringent quality standards for mold and other performance-robbing substances.